It had been a while since AAPL shareholders such as myself were really blown away by a positive earnings report, but yesterday’s was a doozie! Yesterday before the earnings release I wrote about why I am an AAPL shareholder and why I believe the stock was a worthwhile investment for me at $488 per share. Since I didn’t make any specific predictions about yesterday’s earnings report, my “I told you so” will be somewhat tempered. Without some kind of inside knowledge about the financial performance of a company, predictions about a company’s performance on any given three-month period are essentially nothing more than guesses. For me, that is certainly the case. Most of my investment ideas, such as the ones I shared about Apple yesterday, revolve around the long-term performance of a company or stock. Any short-term trades I make typically revolve more around an idea I have about how other traders will react to a given catalyst, which is a much more predictable event than guessing what a company’s quarterly revenue will be. In this sense, if good news is expected, everybody buys before the news comes out. When the good news actually gets released, the stock doesn’t move because everybody already knew the news was coming, and there is nobody left to buy! So the recipe for a spike in share price from a catalyst such as an earnings report is not for a company to release a good report. It is for a company to release a report that is better than expectations. The best way to gauge the expectations of traders in the market is to look at the expectations of financial analysts. For whatever reason (surely not due to stellar past performance…), traders tend to think that market analysts know what they are talking about. So when the composite EPS estimate by Wall Street analysts for AAPL was $10.18, traders took that to heart. When the consensus estimate for AAPL’s quarterly revenue was $43.5 billion, traders expected to see $43.5 billion of revenue in that earnings report. So when Apple’s earnings report came out yesterday and informed the market that it’s actual EPS was $11.62 (not $10.18) and its actual revenue was $45.6 billion (not $43.5 billion), traders were caught off guard, and a surprise such as this one usually moves the share price. I wrote yesterday about how there seems to be a common misconception out there that Apple’s revenue has peaked and is now in decline. If you want my opinion on the matter, you can read what I wrote yesterday. 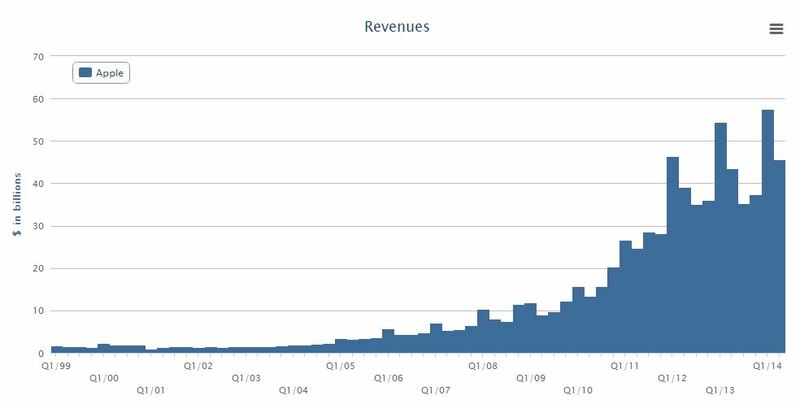 I’ll simply post a chart of AAPL’s quarterly revenue since 1999 that has been updated since yesterday’s report, and you can decide for yourself. So the first piece of good news for AAPL shareholders was that the company beat expectations on revenue and EPS. Great! But the good news didn’t stop there. I recently wrote about the power of dividends, and AAPL pays a decent 2.2% dividend to its shareholders. However, AAPL sweetened the deal yesterday when they included in their earnings report an announcement that they will be increasing their dividend by 8%! That increase won’t be making anybody rich, but it sure doesn’t hurt. Another announcement that was included yesterday was that Apple will be increasing the amount of cash it will be spending on buying back shares of its own stock from $100 billion to $130 billion. Not only do share buybacks decrease the number of shares in the market, they also provide support for the share price. We don’t know how the rest of the market will treat AAPL over the next year, but we do know that there will be $130 billion worth of buy orders at some point! Finally, buybacks are a sign that a company is feeling confident about its future. If Tim Cook thought AAPL’s share price would be dropping in the near future, he wouldn’t be wanting to buy back stock at this price level. So just how good was all the good news for AAPL shareholders? Pretty damn good. As of this minute, AAPL shares are up over 8% today, and the “Apple effect” is so great that iPhone suppliers such as RF Micro Devices (which I also currently hold in my portfolio for the reasons I described here) are also spiking today on the good news, with RFMD up nearly 7% so far today. Want to learn more about dividends, stock catalysts, buybacks, and stock splits? Would you like to know the simple steps I take to accurately determine the expectations of other traders? I don’t have a degree in finance; I have a degree in neuroscience. You don’t have to predict what stocks will do if you can predict what traders will do and be one step ahead of them. I made a 400% return in the stock market in five years using only basic principles of psychology and common sense. To read about how I did it, check out my book, Beating Wall Street with Common Sense, and stay tuned to tradingcommonsense.com!